University of Toronto Engineering alumna Julie Payette, one of two U of T alumnae astronauts to go to space, will be named Canada’s next Governor General, news reports say. Payette, who speaks six languages, earned her master’s of applied science in electrical and computer engineering from the U of T in 1990, after earning her undergraduate degree at McGill University. In 2001, she received an honorary degree from U of T.
Professor Graeme Hirst says that while Payette was a master's student in the Edward S. Rogers Sr. Department of Electrical & Computer Engineering (ECE) she took his computational linguistics course out of interest and found her new passion. Payette wrote her master’s thesis – Intelligence Computer-Assisted Instruction in Syntactic Style – on computer-based second-language instruction, a "system that is meant to assist language instructors in teaching principles of syntactic style to students of English". Her thesis was co-supervised by Professors Hirst and Michael Stumm (ECE). 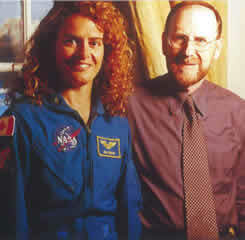 Payette, who joined the Canadian space program in 1992, spent more than 600 hours in space aboard the space shuttle Discovery in 1999 and aboard the Endeavour in 2009. On Discovery, she served as a Mission Specialist, was responsible for the station systems, supervised the spacewalk and operated the Canadarm robotic arm – and became the first Canadian astronaut to board the International Space Station. On Endeavour, she operated all three robotic arms: the shuttle's Canadarm, the station's Canadarm2 and a special-purpose Japanese arm on Kibo. She retired from the Canadian Space Agency in 2013.